Lately, with the snow-ice-bitter-cold-rain-back-to-ice-again we’ve been facing, I find myself missing this. Feeling closed off, a bit stir-crazy…We get creative. Turn the basement into a Lego museum, hold Simon Says competitions, have pillow fights…but we miss our stoop time. What is it about sitting on our front stoop, still in our pajamas, that is so appealing? It all started when my oldest was a baby. As he was born in June, I passed my warm-weather maternity leave days taking walks with the snap ‘n go, stealing coffee breaks in the park once the baby fell asleep, and singing songs to him from the front stoop. I never needed to go far, or interrupt nap “schedules,” to get a dose of the outside. Plus, fresh air was often the only way to soothe my feisty firstborn. 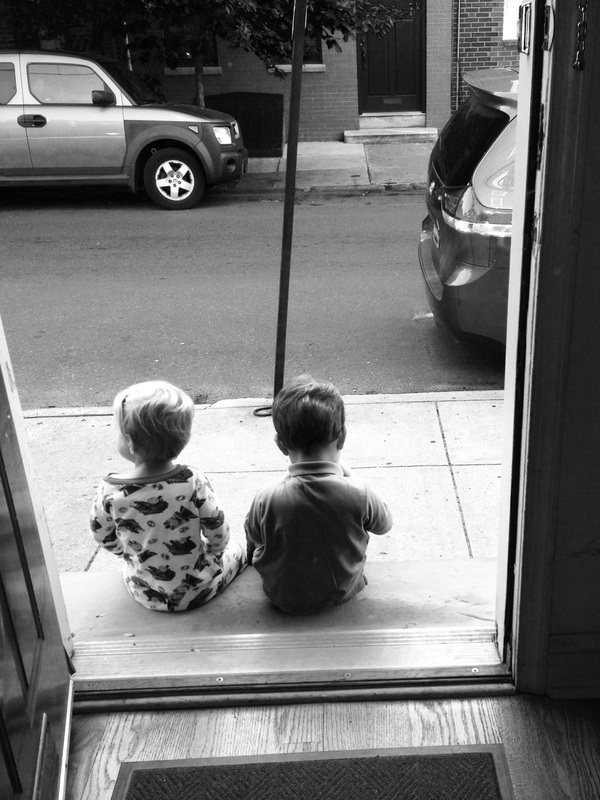 Later on, I sat on the stoop with my second baby, waiting and watching for his older brother to come home from nursery school. Eventually, “stoop-sitting” morphed from simply a way to satisfy my voyeuristic tendencies into a pastime unto itself. Anticipating the garbage trucks on Thursdays. Scoping out the mailman. Learning the bus route. The older boys “checking the weather.” Being on the lookout for Daddy to get home from work. Once–on a lucky day, a backhoe loader rolled right on by and stopped just in front of our house to ask directions! Fodder for weeks. Husband and I transformed it into adult time by inventing “stoop wine” with the next-door neighbors–setting up folding chairs just outside our adjoining front doors after bedtime, baby monitors in hand to alert us if any of the kids (their 4 or our 3) were calling. A night “out” without babysitters! Not bad. When we sit on the stoop, it feels like we’re letting people in. Making the world a little smaller. Making the outside feel like an extension of our home. Making it more okay to let people see who we are and where we live…instead of being afraid, guarded, and “siloed” all the time. Neighbors pass by, the older gentleman who lives at the corner comes over to bestow a belated baby gift, a t’ai chi class kicks off in the park across the street, strangers stop for a chat or to coo over the baby. Life happens. Right in front of our eyes. Right from our front stoop. I love this Dina!! Who knew wed have half a soccer team worth of boys from that new dorm suite!!! Love your insights and more importantly your humor!!! Hope to catch up at some point!